Wanted Dead or Alive slot machine from Playtech is a 5-reel, 25 payline video slot that has a very nice maximum jackpot of 10,000x per line bet. The mobile slot has one bonus round, although no free spins or multipliers involved in that. You can check out the full Wanted Dead or Alive slot review below, and we have a bonus for you as well to give the game a try. If you enjoyed playing cowboys and Indians as a kid, you’ll love the simple premise of Playtech’s Wanted Dead Or Alive slot – five-reel, 25-payline game with a theme inspired by the Wild West. Set to a backdrop of a traditional American frontier town, the Wanted Dead Or Alive slot machine features all of the stereotypical imagery that you’d expect from a Wild West slot, with a colourful cast of outlaws representing the higher value symbols and fizzing sticks of dynamite acting as substitute wild icons. The game also features two scatters which can be used to trigger separate mini-games, while a maximum base game jackpot of 10,000x is up for grabs on any regular spin. Playable from as little as £0.25 per turn, the game is a mobile-only title and features a user interface that has been designed specifically for smartphone devices – making it the perfect slot to play while you’re out and about. 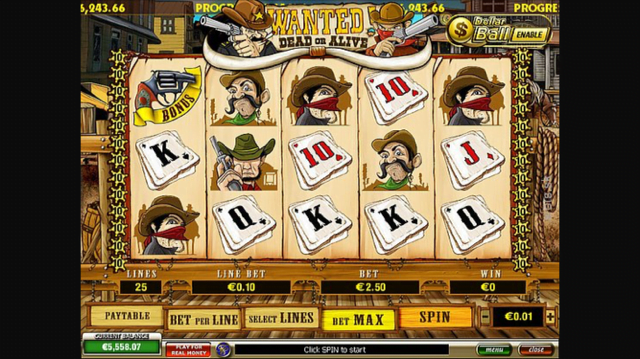 As mentioned above, the Wanted Dead Or Alive slot features two pick-and-click style mini-games that are both activated by landing scatter symbols across the various base game reels. The first is a simple game that is triggered whenever three bags of gold appear anywhere in view, with this requiring mobile casino players to simply select one of the bags to reveal a cash prize that can be worth up to 200x their bet. The second feature is a little more engaging and is launched whenever pistol symbols appear on reels one and five simultaneously. When this happens, mobile casino players will be transported to a new screen where they’ll have to shoot six locations to drive out one of the bandits. When players find the outlaw, he’ll wave a white flag and they’ll receive a payout based on the number of shots they fired. Unfortunately, the one major drawback of Wanted Dead Or Alive is that there is no free spins feature, but this is at least compensated for by the fact that base game prizes are fairly substantial. While the Wanted Dead Or Alive slot is an incredibly functional title, the game is badly let down by its lack of free spins and multipliers; with this ultimately making it a pretty forgettable experience. Like the Wanted Dead Or Alive slot review? Check out these as well…..